Glasgow Housing Association’s Andy Ashcroft discusses how its work is changing the face of the city with agendaNi. While once considered a failing organisation, Glasgow Housing Association (GHA) has transformed itself over the last five years and, in doing so, has helped to regenerate some of the most deprived parts of the city. 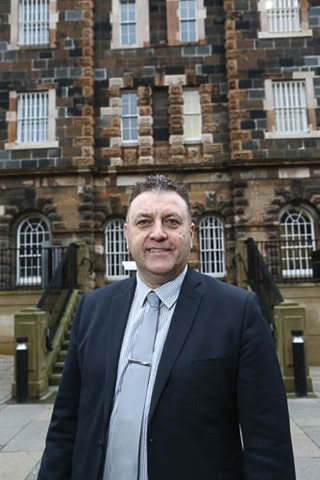 Andy Ashcroft, its Area Director for North East Glasgow, is visiting Belfast to outline the progress made at the Northern Ireland Housing Conference. The organisation, the largest in Scotland, was on the verge of closing down in 2008 but has been turned around under the leadership of Chief Executive Martin Armstrong. The association has also “got relationships in a better place” with both the Scottish Government and Glasgow City Council, and is now broadening its horizons to work with other local authorities in trying to meet the needs of some of their communities. Welfare reform is a “huge challenge” in the Scottish context. The GHA depends on housing benefit for 65-70 per cent of its income and he sees a “real risk” of tenants defaulting on rent if they are given the money directly. The GHA has demolished several tower blocks over the last 10 years to pave the way for regeneration. It is a member of the Wheatley Group, which also includes four other associations: Cube, Your Place, Lowther Homes, Loretto Care and West Lothian Housing Partnership. The group owns 45,000 social rented homes and operates across 10 local authorities in the central belt of Scotland. Since its transfer into the group, the GHA has invested £1.2 billion across Glasgow with the aim of making homes warmer, safer and drier. This represents an additional £900 million in the Glaswegian economy and the creation of 4,337 new jobs. The GHA has completed 1,000 new social rented homes and another 1,100 are due to go on site. It still works in very challenging communities. Seventy per cent of its homes are in what have been assessed as the most deprived areas of Scotland. One third of its customers are over 60 years of age. 3,400 customers have a mental illness, including over 1,000 with dementia. The association sees its work as being “more than bricks and mortar.” Since the transfer, it has provided 4,650 training places, 1,000 arts and exercise classes for older tenants and 600 bursaries to help tenants enter university. Significantly, there have been no fire-related deaths in its homes over the last two and a half years. The number of fire deaths in that period would previously have been around 10. A ground-breaking partnership involves 12 police officers and a fire service officer being assigned to the GHA. The working group holds weekly ‘tasking meetings’ and flags up risks that it identifies across the GHA estate. Glasgow also has around 45,000 private rented properties but over 90 per cent of private landlords have only one or two properties and standards are very mixed. There is a substantial demand for ‘mid-market’ rental housing. Lowther Homes, a fully owned subsidiary of the group, provides full and mid-market rented stock across Glasgow and beyond. It provides 234 full market and 184 mid-market homes and the profits are ‘gift aided’ within the group. The association is focusing on its communities’ needs through its ‘think yes’ approach i.e. bespoke tailored services for tenants. Think yes essentially means that staff are challenged on why and when they have to say no to a customer. Looking ahead, it wants to develop new partnerships to deliver local and national outcomes and use existing assets to raise finance for continued development. These new funding schemes could include bonds and institutional investors and the GHA also wants to provide new opportunities for customers e.g. low cost loans. Affordability, though, will remain a key issue as welfare reform gets under way.